The PDC Premier League has reached night eleven, and the action this Thursday comes from the GE Oil & Gas Arena in Aberdeen. We have a great evening in store with an all-Dutch game between Michael van Gerwen and Raymond van Barneveld, while Phil Taylor and Stephen Bunting will play twice each as they grapple for fourth position in the table. The darts last week came from the Motorpoint Arena in Sheffield, and there were some huge results. Having survived by the skin of his teeth on judgement night, Raymond van Barneveld shocked Phil Taylor 7-2, and put himself in with a chance of reaching the top four. Dave Chisnall continued his sparkling form with two wins on the night over Gary Anderson and James Wade, and he’s now just a point behind long-time leader Michael van Gerwen. The Dutch number one was pushed all the way by Stephen Bunting, but prevailed 7-5, and he’s top with 18 points. Adrian Lewis was the other winner on the night as he made it a miserable evening for James Wade, winning 7-4. It’s a crucial night for Phil Taylor who currently sits fourth in the table. The four players behind him are all within two points, and he will be hoping to get something from his double-header against Dave Chisnall and Stephen Bunting. Four of the five matches catch the eye from a betting perspective, and we’ve got two short-priced tips and two outsiders to follow for the evening. We’re loathe to back against Phil Taylor at the best of times, but the fact remains that the Power has lost four of his last five Premier League matches. A game against the league’s form player in the first match of the night is probably the last thing he would have wanted. Taylor uncharacteristically missed doubles last week in his 7-2 defeat to van Barneveld, and he will need to be back to his best tonight. Chisnall beat James Wade and Gary Anderson last week as he picked up four points, and he’s playing some of the best darts of his career. If he was playing almost anyone else he’d be a much shorter price, and he’s already beaten Taylor once this season. 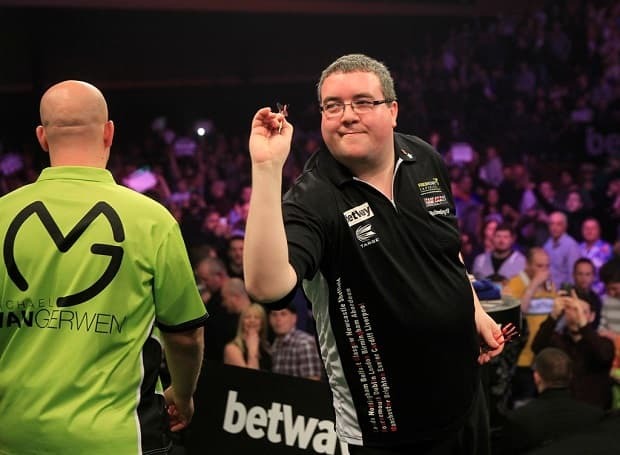 Stephen Bunting is another who looks well overpriced for his first match of the night against Adrian Lewis. Bunting led 5-4 against van Gerwen at one point last week before going down 7-5, and he’s already beaten Lewis this season. That was back at the start of March, when Bunting won 7-3. He may be at the bottom of the Premier League table, but he’s only two points behind Phil Taylor in fourth place, and a couple of good results this week will put him in a great position. Adrian Lewis beat James Wade last week, but he’s been inconsistent all season, and he’s also just two ahead of Bunting on nine points. At the odds, Bunting looks well worth siding with. Gary Anderson said in the build up to tonight’s games that he was looking forward to the night in Scotland. With the Premier League only going North of the Border twice in the season, he’ll be determined to put on a show in front of his home fans. He’s a short price to beat James Wade, but its still worth taking. Anderson sits third in the Premier League table on 13 points, four ahead of the chasing pack but three behind Dave Chisnall in second place. He’s one of the three players who have shown decent form this season, and he’ll want to bounce back from his defeat to Chisnall last week. Wade had a good opportunity last week with two matches, but failed to register a single point after losses to Adrian Lewis and that man Chisnall again. He’s another of the players on nine points, but it’s a big ask to take on Anderson in front of a patriotic crowd. Raymond van Barneveld always receives a good reception in this part of the world, but that might not be enough for him to get the better of his countryman, Michael van Gerwen. It was fine margins for the current Premier League champion on judgement night but he survived with six points, and last week’s impressive win over Phil Taylor has put him in with a decent shout of making the top four. That seemed highly unlikely just a week ago, as van Barneveld admitted himself, but after that win he now believes he can do it. Michael van Gerwen is the stiffest of opposition though, and he’s won 8 of his 10 Premier League matches to lead the table with 18 points. The two Dutchmen played each other just four weeks ago in the Premier League, and van Gerwen came out the 7-2 winner. He’s worth backing to take the points again tonight, despite the short price.